In bacteria, translation starts when ribosomes bind to a specific site (the ribosome binding site, RBS), which is adjacent to the start codon. In eukaryotes, the mechanism is much more complicated. Instead of binding just upstream of the initiation codon, the ribosome binds to the cap at the 5′ end of the mRNA, and reads along the 5′ untranslated region (UTR) until it reaches an initiation codon. The site of protein synthesis is the ribosome. Ribosomes are interesting structures in that they are a combination of RNA and protein. The form of RNA that is found in a ribosome is ribosomal RNA, or rRNA. Translation occurs in three major steps: (1) initiation. (2) elongation, and (3) termination. During initiation, a group of proteins called initiation factors assist in assembling the ribosome around the mRNA. The initiation factors temporarily recognize specific sequences in the mRNA. The small ribosomal subunit then recognizes the initiation factors, followed by the large ribosomal subunit. The ribosome is assembled around the mRNA, much like a series of toy plastic blocks. Near the beginning of the mRNA is a codon called the start codon (AUG). This codes for an amino acid called methionine. Three regions are important as the ribosome is assembled around the mRNA. They are commonly called the A, P, and E sites. Each site will fit a single tRNA. The only tRNA that can effectively enter the site is the one whose anticodon complements the codon of the mRNA revealed within the site. The elongation stage involves the assembly of specified amino acids into a polypeptide chain. The key to elongation are the E, P, and A sites within the ribosome. Following initiation, the first tRNA (for methionine) is located within the P site. A second codon in the mRNA is exposed in the A site. Only a tRNA with an anticodon complementary to the mRNA codon exposed in the A site will correctly fit. At this point there are two tRNAs in the ribosome. As the peptide bond forms, the amino acid is released from the tRNA in the P site. The ribosome then moves one codon down the mRNA (in the 3′ direction). As it does so, the tRNA that was in the P site enters into the E site and leaves the ribosome. A new mRNA codon is then revealed in the A site. A tRNA with an anticodon complementary to the exposed mRNA codon then enters the A site, and the process repeats itself. The rate at which this reaction occurs is amazing. In eukaryotic systems, the ribosome may read up to six codons per second. 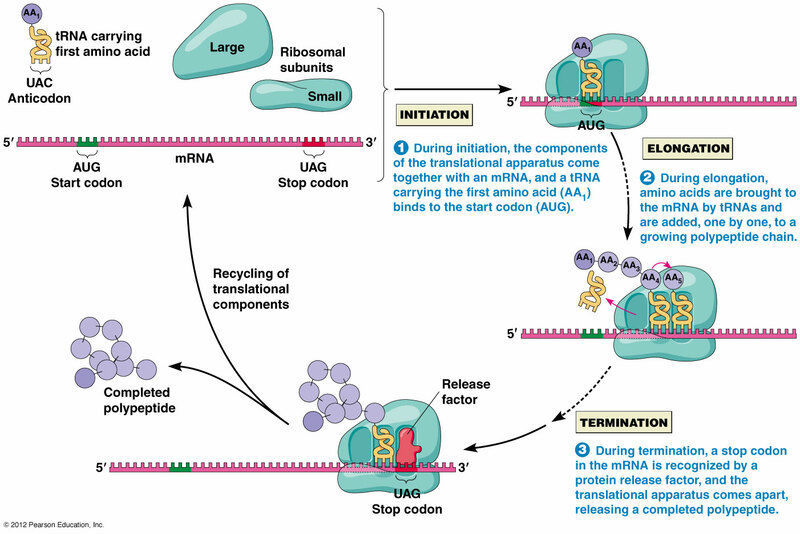 The process of termination begins once the end of the mRNA is reached by the ribosome. In place of tRNAs, proteins called release factors enter into the A site. Since the release factors do not contain amino acids, the process of translation is stopped at this point. The release factors also promote the disassembly of the ribosome and its interaction with the mRNA. The end result of translation is a polypeptide chain. This polypeptide chain must undergo a series of folds in order to produce a functional protein.